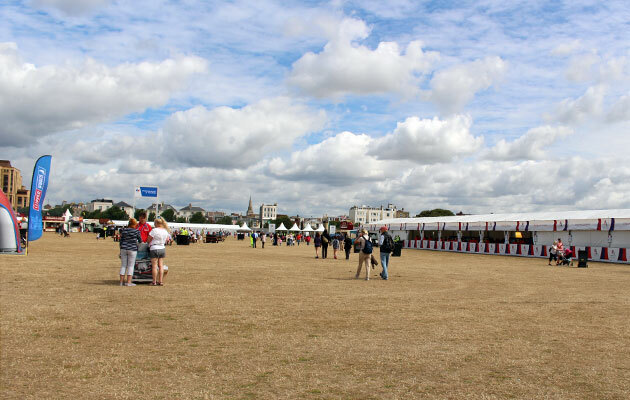 Pulling up to the vast festival site on Southsea Common, it’s clear to see that a great deal of time and effort has gone into the organisation of this huge event. 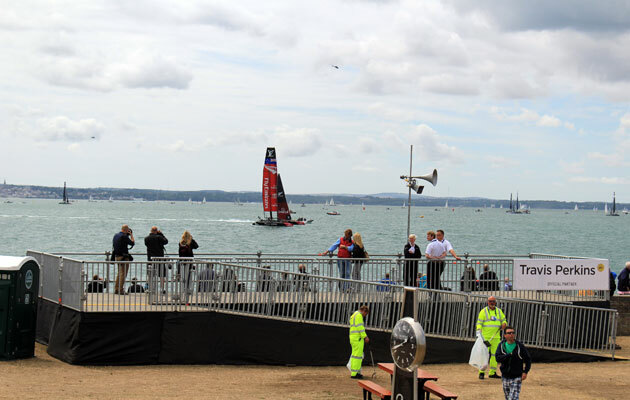 From the banners adorned with the faces of America’s Cup skippers to the gigantic stage and array of food stalls on offer, the America’s Cup World Series (ACWS) Portsmouth has a very special feel about it. I had started my day over in the Camber at Ben Ainslie’s base before heading over to the World Series site and I would strongly recommend a visit if you’re in the area. The sheer size of the base and the level of detail that has gone into the team’s America’s Cup campaign is pretty astounding. With the sun beating down on us, it definitely helped to create a buzz around the World Series site as visitors milled between the various stands and activities on offer. On the water’s edge inside the Waterfront Festival Arena there is a great view to be had, but getting there early will be key for those keen to watch the racing this weekend. Unfortunately there aren’t any vantage points like in the Fanzone Arena, but if you’re unable to get a good view due to the crowds, then there are two large screens on either side of the stage to watch the action on, or take a ride up the Ferris wheel. 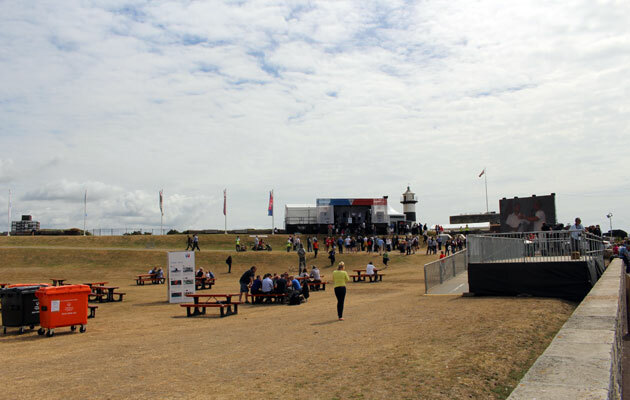 Wandering through to the Fanzone Arena, there’s a long stretch on which spectators can stand and watch the racing, with higher vantage points near the stage. Despite not actually going up the Grandstand, I can imagine the views from here will be quite spectacular on the race days. If you are keen to watch the racing and don’t want to risk missing out, then I’d recommend buying a ticket to the Fanzone Arena if they’re still available, as the racing will take place directly in front of you off the common. 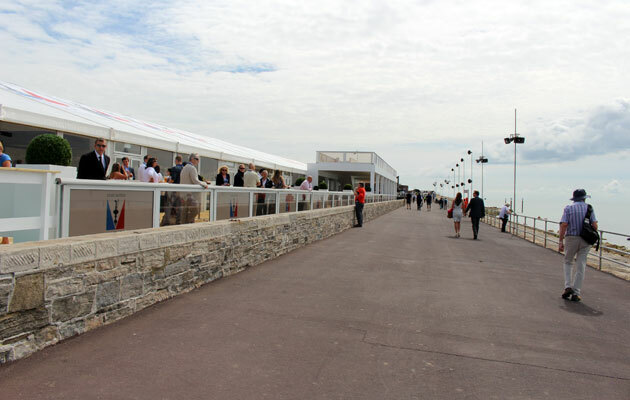 Although spectators will have a good view from the Waterfront Festival Arena, the Fanzone will be the place to be during the racing. There is an abundance of food and drink stands around the site, from a mini Waitrose (which was already proving to be quite popular) to take away Caribbean cuisine. If you’re planning on eating at the site, be prepared for premium prices, with the average cost of lunch and a drink setting you back around £10. I’m no stranger to festivals and similar events, so paying £2.20 for a bottle of water didn’t shock me too much, but it’s definitely something to be prepared for. My other big tip would be to take plenty of cash with you, whether you plan on spending it or not. From what I could see, the bars and food outlets weren’t taking card payments and despite having cash machines, there’s an eye-watering £2.95 charge for a withdrawal. There’s a similar offering in the Fanzone Arena, with a host of food stalls and bars set behind the stage area. 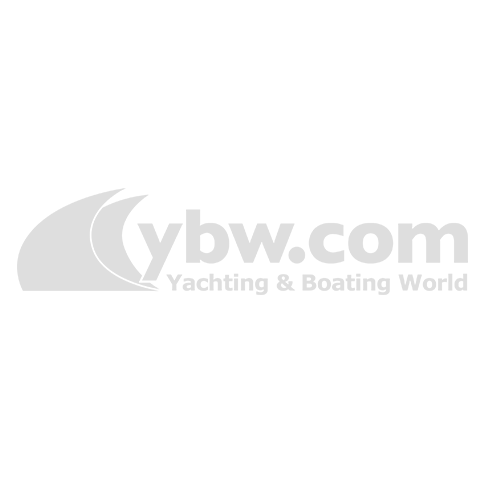 A Moët & Chandon champagne bar is also on offer next to the hospitality tents for those wanting more of a luxury experience. If your visit to ACWS Portsmouth is a family affair then you can rest assured there’s plenty to do. In addition to all the off shore activities such as aerial and foiling moth displays, on land there’s a huge Ferris wheel, climbing wall and giant Wii games screen to keep the kids entertained. A navy raid boat, truck and Red Bull Formula 1 car also make for great photo opportunities. Thursday morning saw the arrival of the America’s Cup to the site, with the trophy being escorted by its own security guard as it made its way along Southsea seafront in a black BMW. After the crowds had gathered round to get a glimpse of the coveted silverware, fans were able to get their picture taken with the Cup. The other main event on the opening day of the World Series, was the Parade of Sail, which all six teams took part in. 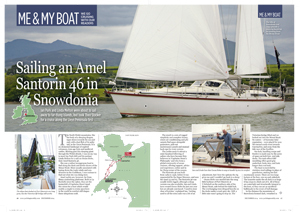 It was great that the boats came so close to the crowds and watching them lift up on their foils was a fantastic sight. Shortly after, the skippers came ashore to do a press conference in the Fanzone Arena, with most of the questions aimed at the home favourite, Sir Ben Ainslie. The other five sailors took it all in good humour, with Jimmy Spithill joking that Land Rover BAR were “clearly faster than everyone”, which was met by a rapturous applause. Driving to the site is definitely ill advised, with parking spaces at a minimum and extremely hard to come by. On Thursday the road closures weren’t too significant but I can imagine that as the event gets busier, this will be wider spread around the area. 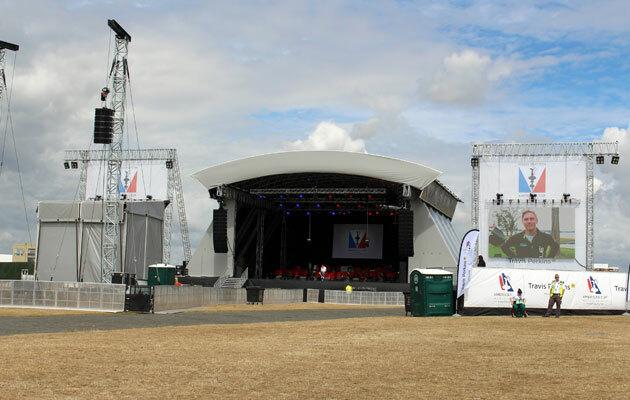 For those who do want to travel by car, you can take advantage of the two park and ride services on offer throughout the event, with more details on the organiser’s website. Both train stations in Portsmouth are less than a 10-minute drive from the site, and with a taxi costing less than £5, it’s definitely the most pain-free way of getting there in my opinion. If you don’t want to be left loitering at the station I’d recommend booking your taxi in advance. 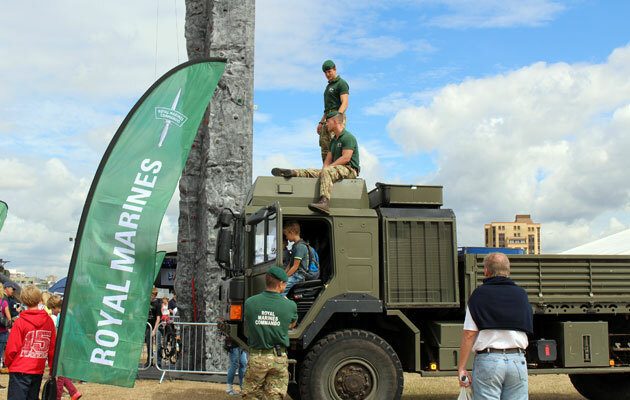 However, there will also be free regular shuttle buses running from outside Portsmouth Harbour train station to Clarence Pier, right by the Waterfront Festival site. Visitors wishing to use the shuttle should take bus number 1 or 23.